-----It is certainly nice to have a trailerable boat. We can take off for navigable water anywhere in the country and be there within a week or two. But, there is a down side to the joy of trailer boating. -----1 1. When you live on the boat, what do you do with the truck and trailer? -----2. When you live in the camper on the truck, what do you do with the boat? -----3.Most difficult of all, after you have boated a long distance from the truck and trailer, how do you get them back together again? -----Every lifestyle has advantages and disadvantages, and living aboard a boat is no exception. Just as we can hardly conceive of the challenges of living in the center of a major city, most 'land folks' have difficulty imagining a life on water. -----There is an immediate choice one must make following the decision to live board. Does one maintain a land connection, via an automobile, or not? There are obvious advantages to be amphibious. If you have a vehicle at the marina, it is easy to travel ashore to go shopping, see a doctor, or just get a haircut. But, like all compromises, there is a down side. What if you cruise on your boat? You might be five hundred miles away from your vehicle at the end of your cruise. Now, having chosen the aquatic way of life, you have no vehicle. How do you get to the post office, a hairdresser, or a grocery? Yep - afoot. There is also the disadvantage caused by owning a 'useless' vehicle. It is just sitting, way back there at the marina - maybe for months. Meanwhile, you pay insurance, pay for the space it occupies, suffer it's depreciation, and endure deterioration. For two years on a sailboat, we were aquatic and had no land vehicle. We had no worries about a car, but we sure walked through shoe leather. -----This time, we decided to live aboard a trailerable boat. What a remarkable transition - all the water on and around our continent suddenly became accessible. Every lake, river and coast is just a drive away. We merely drive to our destination, plunk the boat down a ramp, and go cruising. What freedom. What a plethora of choice. Why, we can even defeat our old nemesis - how to go up a river. Now, we drive to the top of a river, and cruise down. No worries about the old problem of first boating up every river in order to come down. -----However, this freedom, presents another problem. No longer is the lack of a car the problem. Now, the truck/trailer is the problem. How do we retrieve them after a long-distance cruise? Oh, how many times we now wish we could merely whistle for our tow vehicle to come to us. "Fetch, Ford!," we call into the void. And there is no returning answer. -----So, how do we resolve this challenge? How do we get back to the truck and trailer? We have no full-proof answer to that question. We let circumstances and serendipity decide for us. 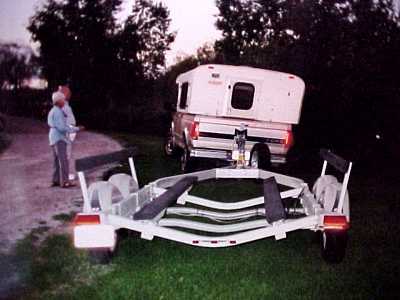 -----First, there are the easy trailering situations. We put in and take out at the same ramp. This is great for cruising on a lake for a week or so. Now, the only difficulty is finding a place to leave the truck that is legal and reasonably secure -- and where there is a good ramp. We find State Parks excellent places to launch and leave the truck. -----Next, come the coastal trips - like the coast of Texas. The length of time and mileage are both extended. Do we put in and out at the same place or cruise one-way? Usually, along a coast, we go both ways from the middle and use a single ramp. -----The imperative now is for a secure place for the truck. We sure don't want to return from a lengthy cruise, ready for a little shore leave, and find the tires (or more) gone from the camper. Sometimes, because of the marvelous C-Dory sites on the Internet, we have met other owners on the Internet who either have space at their home for the truck/trailer or who have local knowledge of a safe ramp. Other times, when we have no 'local' help or knowledge, we have situated at a campground near our hoped-for launch site. 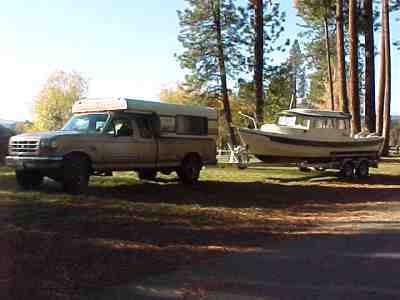 We leave the boat on the site while we scout out a suitable ramp, campground or marina where the truck will be secure. -----We were particularly fortunate when we cruised the Texas coast. We put in at a state park ramp in mid-coast Texas, left the truck/trailer behind the fence of the service yard of the park, and headed to Mexico and back. Now we wanted to head easterly to Houston, and intended another return trip to the mid-coast. But, serendipity struck. We met a boating friend of a C-Dory owner who was driving to Houston to meet friends and offered to drive us back to the parked truck. Such good luck. We returned with him to the truck/trailer, drove to Houston, loaded the boat and headed to a ramp in mid-Louisiana for the next legs of our Gulf cruise. -----Cruising along the East Coast and the Chesapeake, we went both directions from the same ramp, then 'hop scotched' to another ramp and cruised both ways from there. On these trips, cruising both directions has been pleasure. The views are different, going and coming. We usually stay at different anchorages and fuel at different marinas, so each direction is a unique trip. On wide bodies of water, like Long Island Sound or Chesapeake Bay, traveling one way on one shore and returning along the other definitely makes two different cruises. -----Rivers, however, are a completely different story. Traveling upstream is more difficult. Currents are against you. Locking up is more difficult than down, since currents are stronger in the lock when it is filling than when emptying. -----On our Ohio River cruise, we trailered to Pittsburgh, launched the boat, and headed down river - almost a thousand miles. When we arrived at the lower end of the Ohio, we did not relish the idea of turning around and working upstream against the current and the upstream locks. We loved the cruise 'downhill,' but the season was advanced and currents up the river strong. What to do? -----We considered our options. We could rent a car at the end of the trip in Paducah and drive back to the truck/trailer in Pittsburgh. That was an expensive choice, especially since there was a high drop-off charge. We considered driving the rental car to Pittsburgh, and then returning to Paducah in tandem with the truck and trailer to avoid the drop-off fee. This alternative was also expensive, since it added two driving days and additional fuel to the rental. -----Another option was to hop a bus (or train, or plane) and return to Pittsburgh. Unfortunately, this also was costly, since the station or airport was a distance from the marina and would have entailed a taxi or car rental. -----Again, serendipity struck. We didn't have to do either option. We met (quite accidentally) another C-Dory on the river! Max cruised with us a few days, and then volunteered to drive us back to Pittsburgh to get our truck/trailer and leave it at his house several hundred miles below Pittsburgh. We did, and continued our cruise down the Ohio. When we tied off our boat in a marina outside Cincinnati, to visit our son, he volunteered to drive us back upriver to Max's house and our truck. Then, in tandem with our son, we drove to Paducah, and left the truck/trailer at a friend's house, Marge and Tom, C-Dory owners. We returned to our boat in Cincinnati with our son and cruised to Paducah. 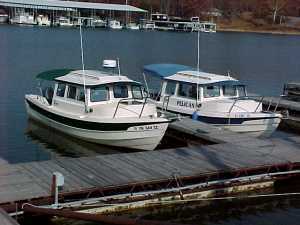 -----A win/win solution to the problem of retrieving a tow vehicle is to cruise with another C-Dory. We have done this on Alabama rivers and on the Upper Mississippi. For these rivers, two owners can 'leapfrog' their tow vehicles. Put in both boats at the top end of a river, drive both tow vehicles to the bottom, leave one, and drive the other back to the top. It is left there and both cruise down the river to the first tow vehicle. There, the boats are tied and the upriver vehicle is retrieved. -----The drives are a pleasure for us, with the companionship of fellow C-Dory owners. The river cruising is enhanced with another boat along. There is the added safety in case of breakdown or grounding (knock wood, hasn't happened to us yet). Most importantly, there is the delight of sharing sundowners, swapping tales, and generally enjoying some good company. 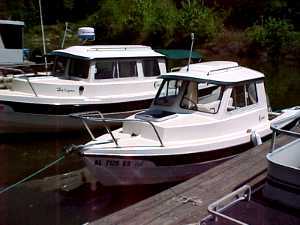 It sounds like a cliché, but it is true - C-Dory owners we have met and/or cruised with have been 'good folks.' Our cruises and lives have been enriched from the experience. AND -- seeing another C-Dory on the river definitely improves the scenery.